Travel Managers, in promoting the Philippines to the world, has chosen the 10 most popular Philippine Fiestas that every Filipino and foreign visitor should experience to get a deeper appreciation of our culture and traditions. Each festival has its own style and unique charm and we present them here to help kickstart your festival journeys this year till next. They are for you to participate in and have great fun. So, take a pick! See the most iconic and beautiful cities of the world that you once thought of, read about or have seen only in pictures. Bring home an understanding for another culture and at the same time, be appreciative of what you have back home. 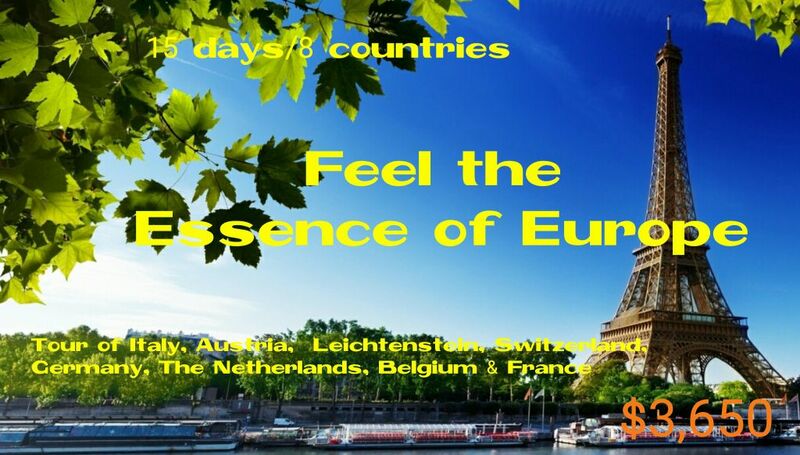 Go over our international and other local tours but do call us for more. You will find that our customized tours will be carefully planned and prepared according to your preferences. 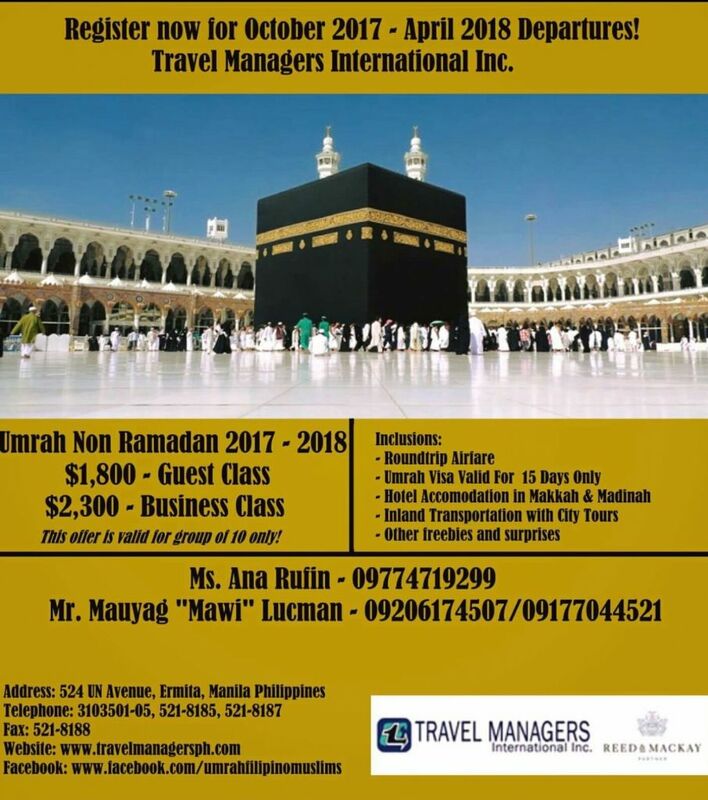 All Muslims are entitled to make the holy journey to Makkah and Madinah and since 2010, Travel Managers has assured comfortable and affordable journeys by offering especially designed Umrah Packages to their customers from The Philippines. If you are unable to find your desired arrangement, do call us. Our concerned Travel Consultants will be happy to prepare an Umrah Package that is most suitable to your requirements. The rates above are subject to change without prior notice. Tax Exemption certificates and Terminal Fee Waiver are subject to government approval. Customized Packages can be arranged. a complimentary buffet breakfast. This 5.0 star property has a business center. Complimentary wireless Internet access is available in public areas. Masjid al-Haram. This 5-star hotel is within close proximity of Well of Zamzam and Kaaba. close proximity of Masjid al-Haram and Well of Zamzam. Royal Clock,visible from 17 kms away, which announces daily prayers to the Muslim world. holy mosque, guests have to check the same with the reception upon check in. a variety of accommodation types to meet all requirements. of Well of Zamzam and Kaaba. Overlooking the Holy Mosque, 100 meters from the King Abdulaziz gate, stands Le Méridien Makkah. The Lechon Festival is a must see festival in Balayan Batangas. The celebration is held annually on June 24, and the feast day of San Juan (Saint John the Baptist). Lechon is one of Batangas delicacy, and even in other provinces in the Philippines. According to the old villager, lechon was served before the Spanish arrived in the Philippines. The dish became a symbol of Batangas tradition to serve lechon during celebrations. 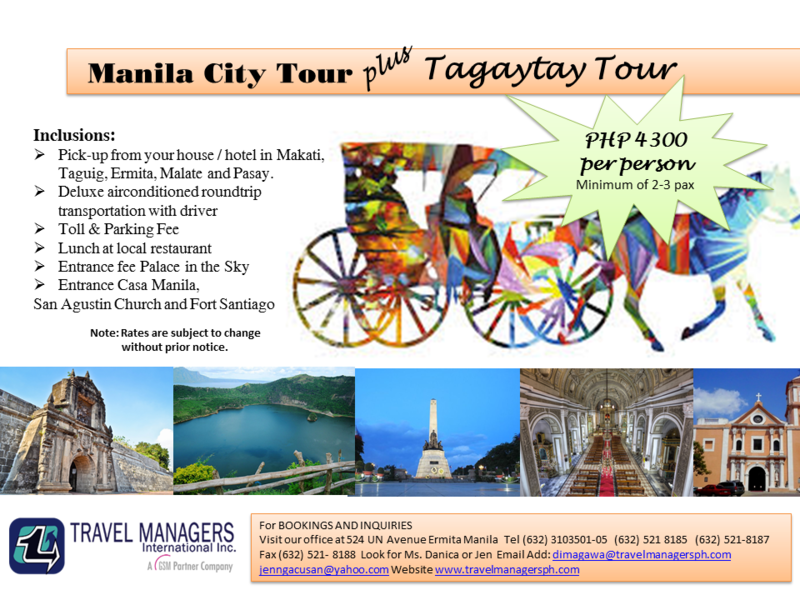 Enjoy this day tour package for only PHP 3,500 per person (minimum of 10 persons), inclusive of round trip transfers, guided city tour and lunch. Pahiyas means "precious offering". This festival is an ancient farmers' harvest celebration way back 16th century. According to legend, San Isidro Labrador magically plowed the field whenever he went out of the church. Each house tries to outdo each other in decorations for the much awaited competition as they vie for the honor of being recognized for their creativity. Also during the festival, the people display their harvest in front of their homes so that the parish priest can bless them as the procession passes by. Since then, the Pahiyas Festival has been a source of excitement for the locals and visitors of Quezon. 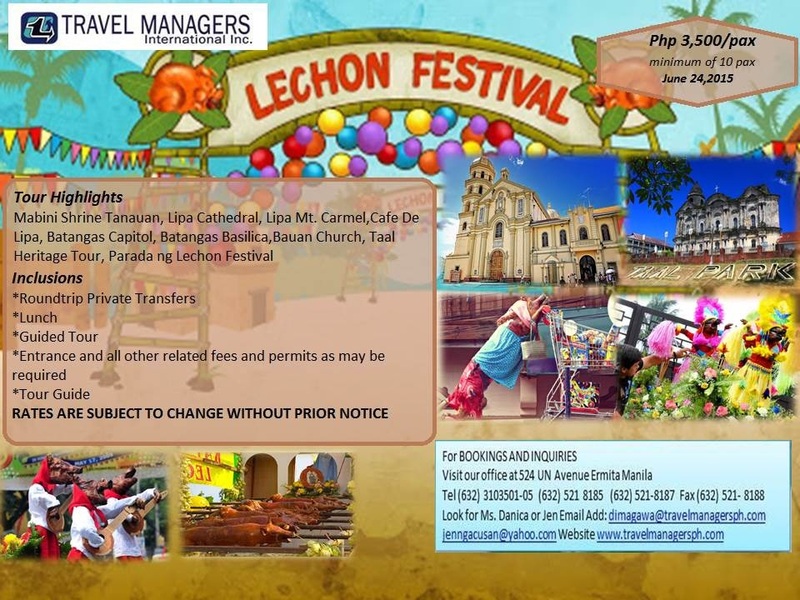 For as low as PHP 1,550 per person , join us as we celebrate the Lucban's Pride - the"PAHIYAS FESTIVAL". Visita Iglesia is a common practice during Maundy Thursday to all Catholic faithfuls primarily to meditate the Passion of Christ. 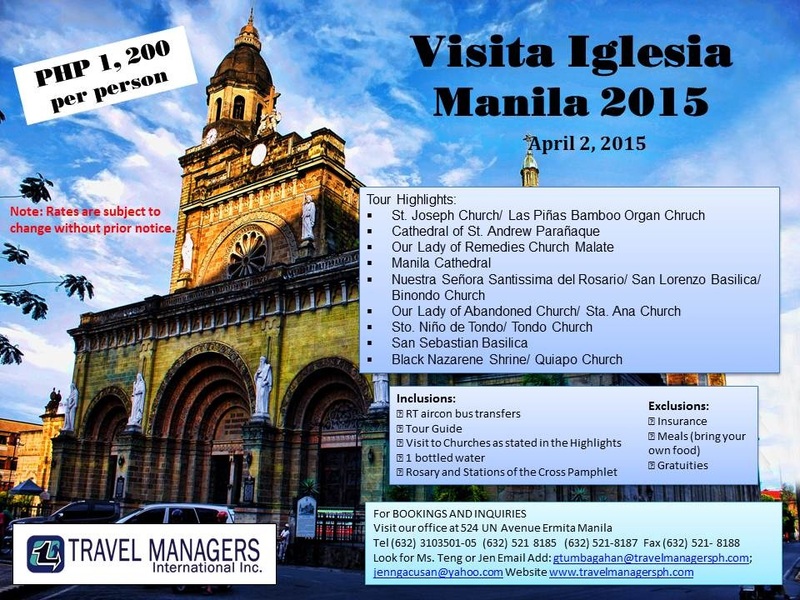 Experience the solemnity of the Manila Visita Iglesia 2015, wherein you will able to visit nine historical churches within Metro Manila, complete with a tour guide and round trip transfers. Book now, for as low as PHP 1,200 per person. Kamay ni Hesus in Lucban, Quezon is the most popular pilgrimage shrine in the country. It is well known because of the famous large statue of Jesus Christ known to be the healing shrine and the devotees attending the healing mass of Father Joseph Faller. 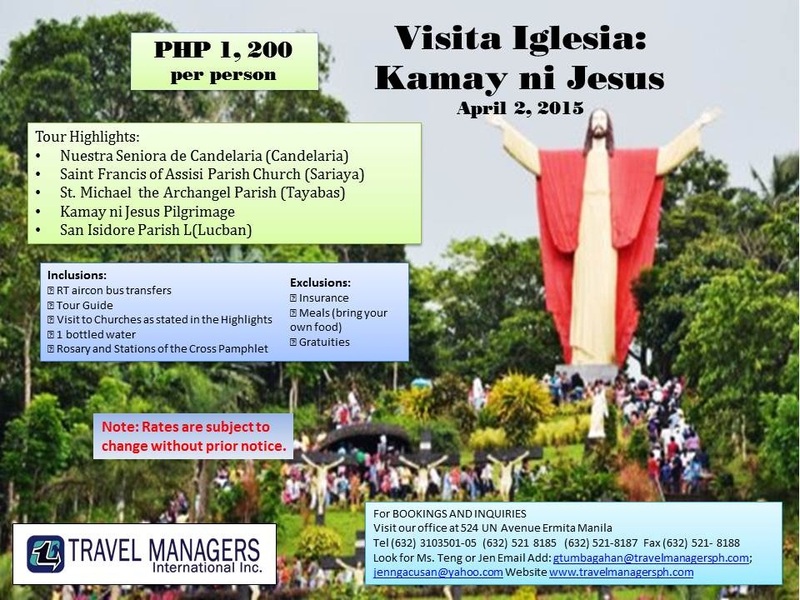 For only PHP 1,200 per person, you will be able to visit four nearby churches in Quezon and the miraculous Kamay ni Hesus Shrine. Kamay ni Hesus in Lucban Quezon is well known because of the famous large statue of Jesus Christ known to be the healing shrine and the devotees attending the healing mass of Father Joseph Faller. 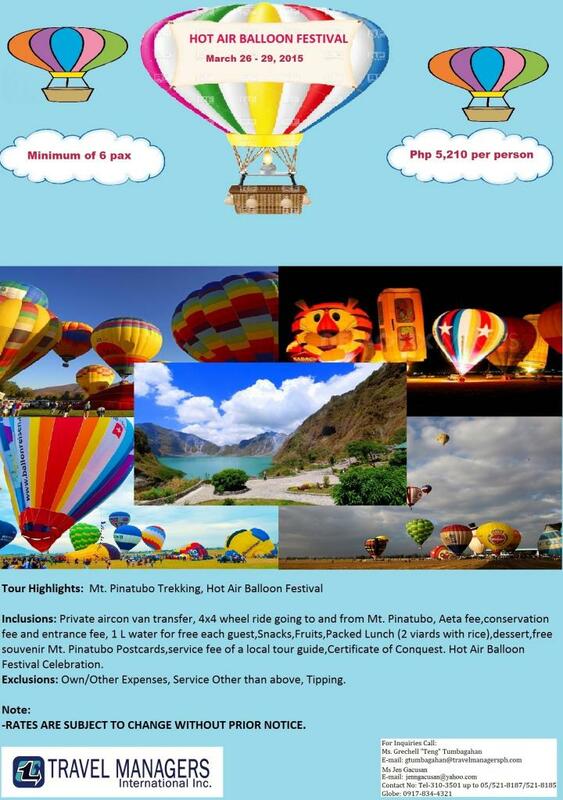 Experience Pampanga's Hot Air Balloon Festival 2015 to be held in Lubao, Pampanga. This festival showcases different styles and colors of hot air balloon, which will be seen dotting in the sky and illuminated by the sunset. Avail now, for as low as PHP 5,210 for a group of 6. You will also have a chance to trek at Mt Pinatubo via 4x4 wheel ride. 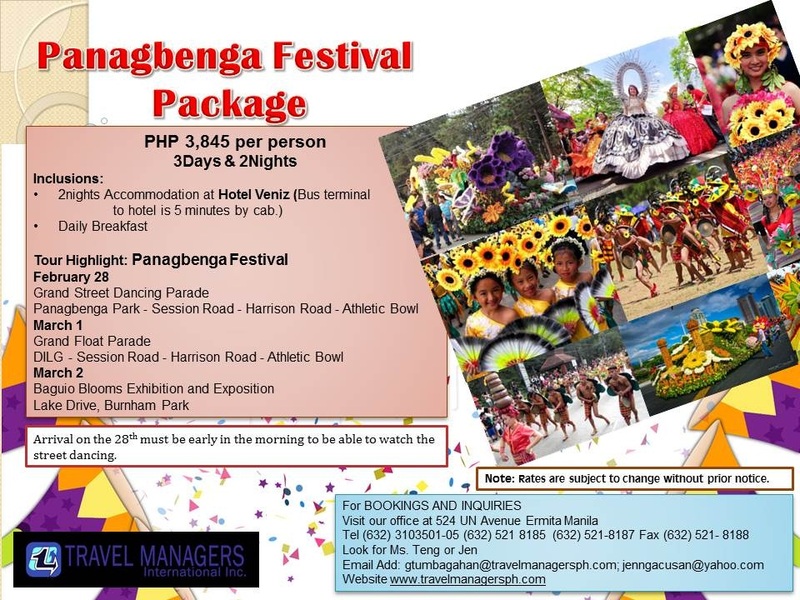 Panagbenga Festival is known as the Flower Festival of the Philippines. It is held annually in the city of Baguio every February. 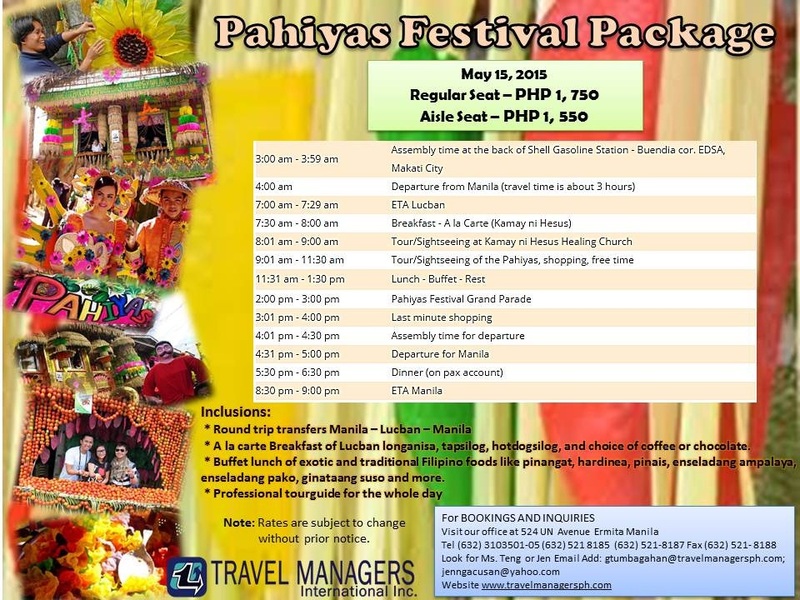 It is a 5 week long celebration and one of the most colorful and most elegant among the Philippine Festivals. It is a tribute to the beautiful flowers of Baguio and a way of rising up from the devastating effects of the 1990 earthquake. Be amazed as the people of Baguio welcomes you to a magnificent display of floats, decorated with flowers. This festival also features street dancing and other exciting course of events. Party, Dance and Have Fun in Kalibo!!! 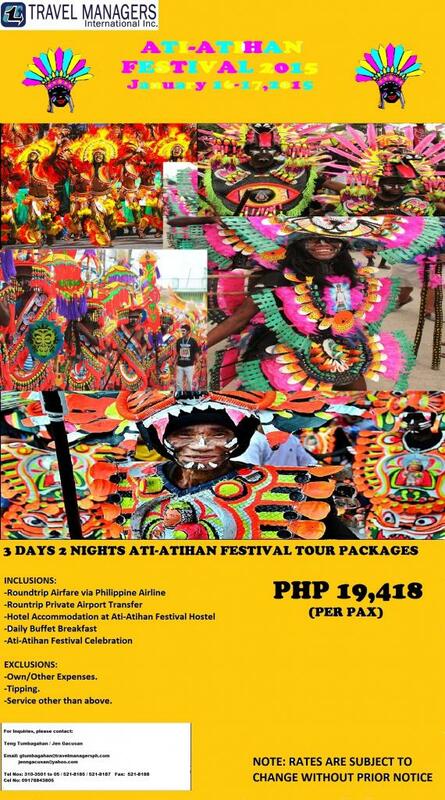 Enjoy the Ati -Atihan Festival 2015, held every 3rd Sunday of January.. Ati-atihan means "make-believe atis". This feast is also been considered as the "Mother of All Festivals", which inspires Sinulog of Cebu and Dinagyang of Iloilo. The whole town of Kalibo comes alive to the beating of drums as the celebration in honor of Sto Nino takes place. It has also been called the "Mardi Gras of the Philippines" for its colorful costumes and lively festival atmosphere. Book now !!! Rates are subject to change without prior notice. 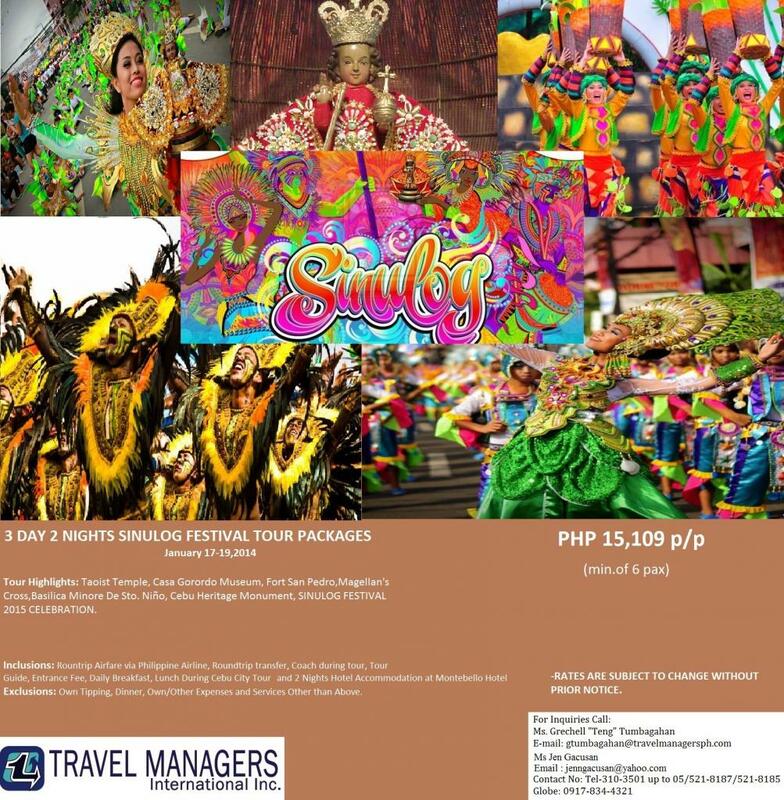 Join the grandest and most distinguished festival in the Philippines ---- the SINULOG FESTIVAL. This festival is celebrated in honor of Sto Nino, who used to be the patron saint of Cebu. It features colorful displays of ceremony and pageantry--- Street dancing, parades, concerts, contests and family gatherings. For as low as PHP 15,109 per person (minimum of 6), this festival package is inclusive of airfare, hotel accommodation, transfers and tours. Dinagyang Festival is a religious festival and cultural festival in honor of Sto Nino and in celebration of the arrival of Malay settlers in the country. It is culminated every 4th Sunday of January. This festival features cultural presentations, sports competition, beauty pageants and various sides of events. Join us as we celebrate the festival, complete with airfare and accommodation, transfers and city tour. 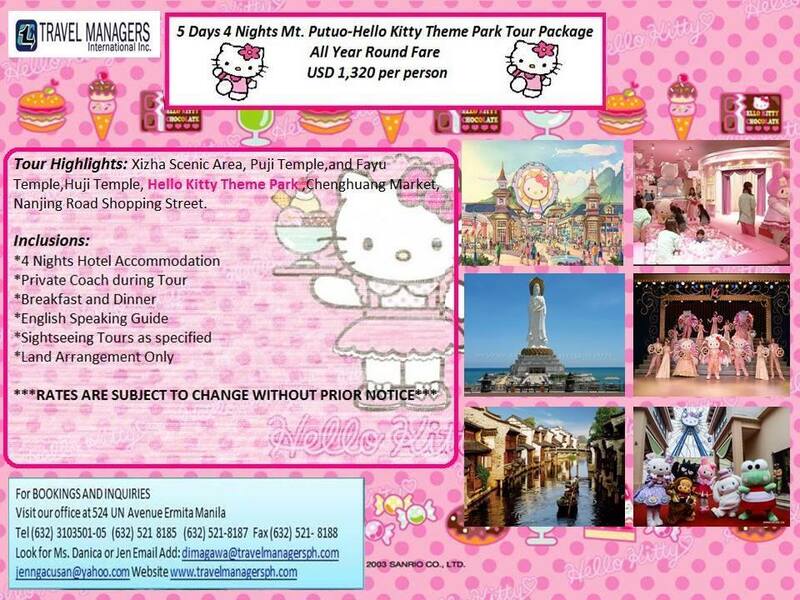 Price start from PHP 13,106 per person. The Sandugo Festival is an annual historical celebration that takes place every year in Tagbilaran City on the island of Bohol. This festival commemorates the Treaty of Friendship between Datu Sikatuna, a chieftain in Bohol, and Spanish conquistador Miguel López de Legazpi. This 16th-century peace treaty occurred on March 16, 1565 through a blood compact or "sandugo". The Sandugo Festival is held every July. Among the major activities during the month is the Miss Bohol Sandugo Beauty Pageant, and the Sandugo Street Dancing Competition which is usually held on the 3rd or 4th Sunday of July. Book now for only PHP 4,100 per person (minimum of 10 persons). Depart Manila on board Turkish Airlines for an overnight flight to Zagreb! Enjoy in flight meals and entertainment. Arrival in Zagreb! After passport formalities at the airport, claim your pieces of luggage and proceed to the exit where our representative will meet and assist you. The board your coach and transfer to the city for sightseeing. Explore the medieval Upper Town, walk along the cobbled stone streets, the St. Mark's Church and see the red roof buildings. After dinner, check-in to the hotel. Enjoy the countryside sceneries of Bosnia and Herzegovina after border crossing as you make your way to the historic Sarajevo. This morning, sightseeing of Sarajevo features the Old Town with cobbled streets, Mosques and Oriental style shop. Go to the surrounding hills with fantastic views over the city and visit Sarajevo Tunnel Museum which was ised to access the airport area during the seige and ferry the supplies into the city. Then to Begova Dzamija ( Bey's Mosque ) one of the biggest Ottoman architecture in the region. After some free time, continue your journey to Medjugorje, an important Catholic Pilgrimage site since 1981. This morning, drive to Mostar, a UNESCO World Heritage site. Upon arrival, visit the graceful Old Bridge with a single span, the colorful Bazaar with traditional handicrafts and see the Mosque and Turkish House. Afterwards, drive back to Medjugorje for a visit to the Apparition Hill and free time for private devotion. Today, leave Bosnia & Herzegovina and cross the Croatian borsder to the city of Dubrovnik, the " Pearl of the Adriatic " and famous for the " Game of thrones " film location. Upon arrival, discover the Old City, also included in Unesco's World Heritage. List, surrounded by mighty walls and Fortresses. See the Stradum, the elegant main street with Onofrio's Fountain, the Franciscan Monastery with the ancient pharmacy, Orlando's Column, Church of St. Blaise and the Cathedral. This morning, enjoy an excursionby crossing the Montenegrian border through thr fjord-shaped Bay of Kotor and stop to take photos of the man-made islet of Our Lady of the Rocks. Then continue to medieval town of Kotor for a sightseeing which includes the beautiful Romanesque Cathedral of St. Triphun, surrounded by walls and fortresses and also a Unesco World Heritage site. Afterwards, Continue to Budva, famous for its beaches and tour the Old Town. See Museum of Budva and the Churches of St. John, Holy Trinity and Saint Sava. Then back to Dubrovnik. Continue your journey today through the Adriatic coast and stop in Trogir, a picturesque small town in an island, connected to the continent with a stone bridge and visit St. Lawrence Cathedral. Then proceed to Split, the second largest city of Croatia. Upon arrival, the walking tour of Split takes you to the historic inner city which shows off the Roman Emperor Diocletian's Palace, a Unesco World Cultural Heritage site. See the remnants of Split's Roman Heritage, it's Renaissane and Gothic structures, Jupiter's Temple, the Peristyle and the Cathedral. Balance of the day is free for shopping. This morning, stop in the oldest city of Croatia, Sibenik. Upon arrival, see the famous monuments such as the Cathedral of St. Jacob and the Fortresses St. Michael and St. Nicholas. Then continue to the magnificent Plitvice National Park, a UNESCO'S World Natural Heritage list and one of the most beautiful natural phenomena in the world with sixteen lakes connected by 92 waterfalls cascade through its picturesque surroundings. Today leave Croatia and cross the Slovenian border to the capital city of Ljubljana. Upon arrival, proceed to sightseeing through the Baroque streets over the picturesque Triple Dragon Bridge, St. Nicholas Cathedral, the beautiful churches and see the Ljubljana Castle. Balance of the day at leisure. This morning, drive to Postojna and visit famous Postojna Caves. After an unforgettable Underground train ride to the heart of the cave system, your guide will bring you on walk through the subtly lit fairt-tale like underground world admiring the delicate spaghetti-like stalactites, massive pillars and other geological wonders. In the afternoon, drive to the beautiful Lake Bled to visit the Bled Castle and round trip Pletna boat to visit inside St. Mary's Church in the Bled Island. Return to Ljubljana in time for dinner. Your memorable Balkan States tour concludes today after breakfast with a transfer to the airport for your flight back home. Arrival in Manila. Home sweet Home ! Depart Manila on board a prestigious airline on your way to Copenhagen, Denmark. Enjoy in-flight meals and services. Arrival in Copenhagen, Denmark. After immigration and customs, meet and greet then commence your city tour. See the Christianborg Castle & Amalienborg Palace. See the Church of Our Savior, Stock Exchange and the world famous statue of the Little Mermaid. Afterwards, transfer to your hotel for dinner and check in. After breakfast, travel North Zealand for a panoramic view of the Kronborg Castle and visit FREDERIKSBORG CASTLE. Afterwards, transfer to the pier and board your OVERNIGHT CRUISE via DFDS FERRY to Oslo, Norway. Buffet dinner on board. Breakfast on board the ferry. Arrival in Oslo. After disembarkation, you will have a city sightseeing. See the City Hall where the Nobel Peace winner are being announced yearly, visit the VIKING SHIP MUSEUM and see the best preserved Viking ships in the world and also visit the famous VIGELAND SCULPTURE PARK, then check-in at your hotel. Dinner at a restaurant. After breakfast, travel over the Swedish border on your way to Stockholm. Upon arrival, check - in to your hotel. This morning, start your half day sightseeing tour with a visit to the VASA MUSEUM and see the only remaining & intact 17th century ship in the world. See the famous CITY HALL OF STOCKHOLM and its courtyard, which is the main symbol of the city and one of the most beautiful & well known buildings in the world as frequently used for the yearly Nobel Prize Awarding Banquet & then see the Royal Palace and the Old Town. Later, transfer to the pier to board your OVERNIGHT CRUISE via SILJA LINE on your way to Helsinki, Finland. Buffet dinner on board. Arrival in Helsinki. After disembarkation, you will have a city sightseeing that includes the Church of the Rock, Sibelius Monument and see the City Hall, the Presidential Palace before checking out the Helsinki Local Art and Craft Open Air Market to shop for souvenirs. Later, check-in at your hotel. Early morning transfer to the train station and board your 2ND CLASS TRAIN to St. Petersburg, Russia. Upon arrival, proceed for sightseeing of the city. Drive along Nevsky Prospekt and see the St. Isaac's Cathedral and St. Nicholas Church, the original citadel of St. Petersburg . Your tour includes the Czar's Winter Palace, formerly the residence of the Czars and now the home of the world famous HERMITAGE MUSEUM where entrance is included, see the world's largest and most valuable collections. Then we proceed to PETRODVORETS (Peter's Palace) also known as the 'Russian Versailles' and the Summer Palace of Peter the Great which was used for a period of 200 years for official ceremonies, sumptuous feasts and formal reception. Visit the Grand Palace and see the numerous fountains, beautiful cascades, and marble statues of gods and heroes. Morning visit to PUSHKIN, the home of Russia's last czar, and visit the gorgeous gold and blue architecture of the magnificent CATHERINE PALACE named for Catherine I, the wife of Peter the Great. In the afternoon, take the 2nd class train on your way to Moscow. Upon arrival, transfer to your hotel. Rest of the day is free. 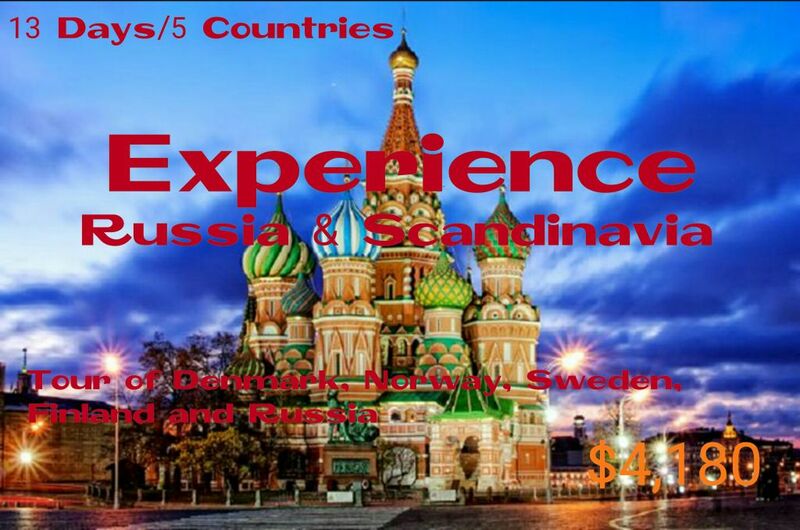 Your sightseeing tour will include a visit to KREMLIN and the Cathedrals, namely the Assumption, Annunciation, Archangel, Deposition and the 12 Apostles Cathedral. Visit the ARMORY CHAMBER and the RED SQUARE and see Lenin's Mausoleum, visit ST. BASIL'S CATHEDRAL and some free time for shopping at the Gum Department Store. Visit to the Underground Metro and see the magnificent murals adorning the stations, and a photo stop at Moscow University. Later, departure transfer to the airport for your flight back to Manila. 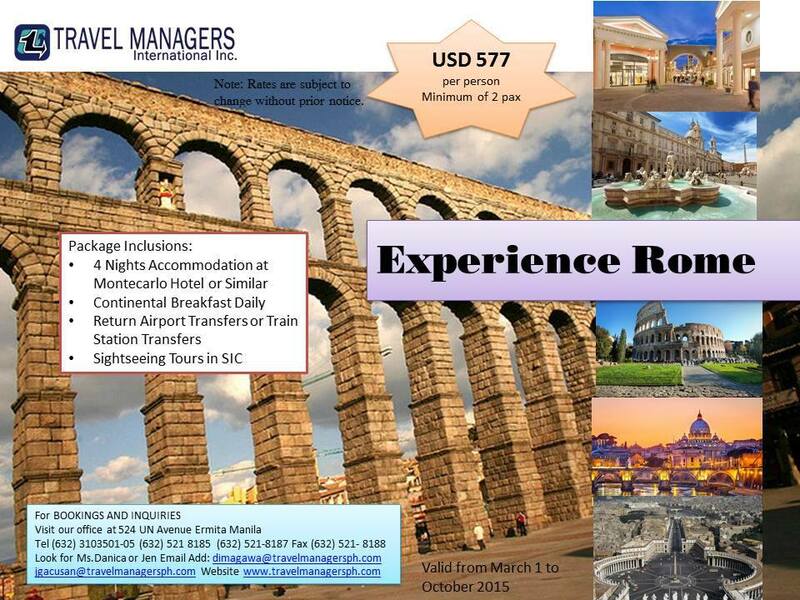 Depart Manila on board a prestigious airline for an overnight flight to Rome. Enjoy in flight meals and entertainment. Welcome to Rome! Upon arrival, proceed to the exit where our representative will meet and assist you. Dinner and transfer to your hotel. Drive to the city for a full day city sightseeing tour which includes a visit to the Vatican Museum, Sistine Chapel and St. Peter’s Basilica. Afterwards, continue the tour seeing the Colosseum, Roman Forum, the beautiful Piazza de Venezia, the Spanish Steps and the Fountain of Trevi. After dinner return to your hotel. Ascend to Assisi, the beloved town of St. Francis, to visit the Upper and Lower Basilica and see the Tomb of St. Francis where you can offer some prayers. Drive to Pisa for a photo stop of the famous Leaning Tower and Pisa Cathedral. Transfer to your hotel in Montecatini Terme for dinner and check in. Continue your drive to Venice. Upon arrival, take your boat to Venice Island. See San Marco Square and admire the Byzantine St. Mark’s Cathedral, the Clock Tower, the Bridge of Sighs and a panoramic view of the lavish Doge’s Palace. Afterwards see a Murano Glass blowing demonstration. Then re-board your coach for dinner and check in to your hotel for overnight. Cross the Austrian border today to Innsbruck see the Golden Roof before your visit to the Swarovski Crystal Gallery for a chance to buy some crystal ornaments. Later, transfer to your hotel in Feldkirch for check in. Leave Austria and cross the border to Vaduz, the capital of Liechtenstein, dominated by its Castle perched on a hilltop. Continue to Switzerland on your way to the lakeside town of Lucerne for shopping of Swiss products. like, knives, chocolates, Bally shoes and perhaps, a Rolex or an Omega watch. Drive to the capital of Bern and check in to Hotel. Today we see the Swiss Countryside for an excursion to the mountain resort of Glacier 3000 (weather permitting or will be substituted by an alternative mountain resort), an important centre for adventure sports, lies between Lake Geneva and Gstaad at an altitude of 3000 metres. We board at Col Du Pilon Station for a cable car ride for about 15 minutes that will bring us to the resort. With Snow all year round. Have some free time to enjoy snow activities that are available during the season. Drive back to Bern. Leave Switzerland, then cross the German border to Titisee, renowned for its Cuckoo Clock industry. Afterwards, drive pass the Black Forest region on your way to your hotel for overnight. More of German countryside sceneries as you make your way to Cologne and visit the 13th - century Gothic Cathedral with its soaring twin – spires. It is the seat of the Archbishop of Cologne and the administration of the Archdiocese of Cologne. It is a renowned monument of German Catholicism and Gothic architecture. Then cross over the Dutch border to Amsterdam. This morning, visit a Cheese and Clog Farm and learn how the Dutch people mastered the art of making cheese and clogs. Afterwards, take photos of a picturesque Windmill then drive to a Diamond Polishing House for a visit. Later, go on a cruise of the ancient canals of Holland’s Golden age aboard a glass - roofed launch and admire the gabled houses and humpback drawbridges. Afterwards, proceed to the restaurant for dinner then back to your hotel. Drive through the Belgian border to Brussels. Stop in Heysel district for photos of the famous Atomium, forming the shape of a unit cell of an iron crystal magnified 165 billion times, before heading to the beautiful Grand Place, surrounded by opulent guildhalls and two larger edifices, the city's Town Hall, and also see the Mannekin Pis. Then cross the French border to the glittering capital, Paris! After breakfast, drive to the city for a half day city tour of Paris as you see the sights of both banks of the River Seine: the Arc de Triomphe, Champs Elysees, Concorde Square, the Place Vendome, Opera House, Notre Dame Cathedral, the Eiffel Tower plus a River Seine Bateaux Mouche Cruise. After a short free time for shopping, proceed to dinner then return to your hotel. Your memorable tour concludes today with a transfer to the airport for your flight back to Manila. Depart Manila on board a prestigious airline to Zurich, Switzerland. Enjoy in-flight meals and entertainment. Welcome to Zurich! After immigration clearance at the airport, proceed to the exit where our representative will meet and assist you. Proceed to city of Zurich for orientation tour Zurich to see the historic heart of Zurich, the Altstad, the St. Peters Church and the Fraumunster Church. Spend some free time shopping in Bahnhopstrasse, then proceed to Lucerne for hotel check in. After breakfast, board your transfer on your way to the mountain resort of Mt. Titlis with an elevation of 3238 meters, before spending time the rest of the day to shop for famous Swiss products like. Knives, chocolates, Bally shoes and perhaps, a Rolex or an Omega watch. After breakfast, cross the border to Vaduz, the capital of Liechtenstein, and see the Castle perched on a hilltop. then Continue to Salzburg, Austria. Dinner and overnight in Salzburg. DAY 05 / SEP 28 SALZBURG – PRAGUE (5 HOURS) (ABF,D) After breakfast, visit the Mirabelle Gardens and the Old Town to see the House of Mozart. Then cross the Czech border to Prague, capital of the Czech Republic for dinner and overnight. The walking tour of this beautiful city starts in the Prague Castle and see St. Vitus Cathedral, St. George Basilica, the Old Royal Palace, Golden Lane and to the Daliborka Tower. Then continue your walk crossing the St. Charles Bridge and visit the Church of our Lady of Victorious to see the Sto. Nino De Praga. Afterwards, on to the Astronomical Clock in the Old Town where the tour ends. The rest of the day is free. After breakfast, travel to Germany to the city of Dresden and see Frauenkirche, Germany’s most important Protestant church before admiring the Procession of Dukes, a colossal mosaic on the castle wall. Next door we see the cathedral and the tiered façade of the Semper Opera House – the only theatre in Germany that bears the name of its architect. View the Royal Palace – a castle built some 700 years ago and reconstructed as a museum. Continue to Berlin for dinner and overnight. Sightseeing today includes Potsdam the capital city of the German federal state of Brandenburg. Later panoramic views of the Ku’damm, Kaiser Wilhelm Memorial Church, Tiergardten, the Victory Column, Bellevue Palace, Congress Hall, Kanzleramt, Reichstag, Alexanderplatz, Unter Den Linden and stop for photos in the Checkpoint Charlie, the Brandenburg Gate and the remains of the famous Berlin Wall. Balance of the day is at leisure. Cross the Polish border to the capital, Warsaw. Upon arrival, check-in to your hotel. Rest of the day is free. Morning drive around the city to see many historical monuments such as the Palace of Culture, St. John Cathedral, a visit to the Gardens of Lazienski Palace and orientation of the Ghetto Memorial. Then walk the Royal Route to the Old Town. Then in the afternoon long distance drive to Czestochowa for check-in. After breakfast visit the Jasna Gora Monastery and see the Black Madonna, venerated as the “Queen of Poland”. Continue to Auschwitz to visit the Concentration Camp, a chilling reminder of the Holocaust. Then onto the historic Cracow. Full day sightseeing today starts with a drive to Lagiewniki to visit the Shrine of the Divine Mercy of Sister Faustina. Then continue to the city and walk along the famous Courtyard of the Jagiellonian University and the Old Town. Later, visit the famous Wieliczka Saltmines, The mine's attractions include dozens of statues, three chapels and an entire cathedral that has been carved out of the rock salt by the miners. Return to the city in time for dinner. Travel over the Hungarian border on your way to the capital city of Budapest. Upon arrival, check in to your hotel. Morning commence your sightseeing tour which features the Castle Hill, the Fisherman’s Bastion to enjoy a panoramic view of the city and the Parliament House, the 13th century Matthias Coronation Church, the Citadel of Mount Gellert and the Heroes Square. Afterwards, drive to Slovakia on your way to Bratislava for a walking tour of the Old Town and you will view from the coach the Presidential Palace, Bratislava Castle, then continue drive to Vienna for dinner and check in to your hotel. 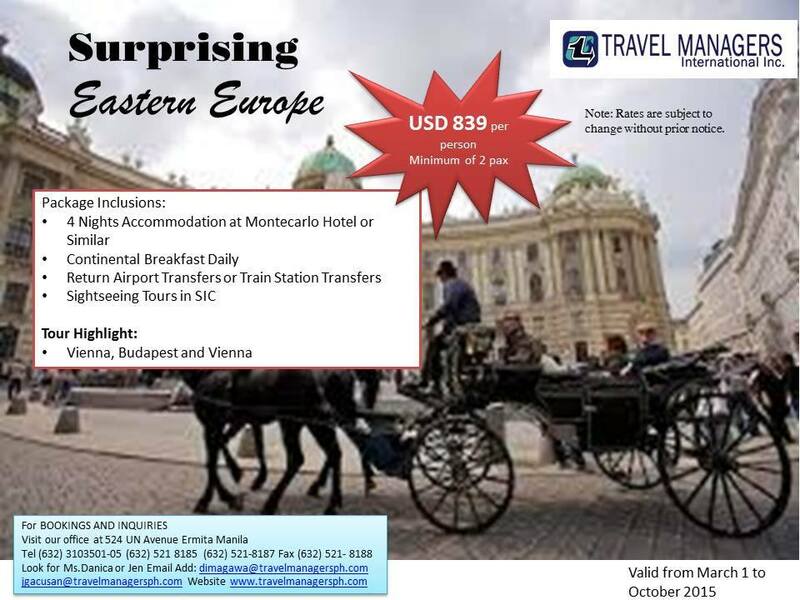 After breakfast, city tour of Vienna to include for panoramic sightseeing tour which includes State Opera House, Museum of Natural History & Contemporary Arts, Belvedere Palace, Prater Amusement Park with its giant Ferris Wheel, and a visit to the magnificent Schoenbrunn Palace. After dinner, check-in to your hotel. DAY 16 / OCT 09 VIENNA / MANILA (ABF) Your memorable tour concludes today after breakfast with a transfer to the airport for your flight back to Manila. Arrive in time at NAIA Terminal One for the 2220H flight. Meet and assist in Madrid Airport. Proceed to hotel and check-in. Rest of the day is free to explore the capital of Spain. Madrid is a cosmopolitan city that combines modern infrastructure with its status as an economic, financial and administrative center with an immense cultural and artistic heritage with more than 60 museums covering all human knowledge. The Puerta del Sol square, the very center of the city and the “Paseo del Arte” art route - whose name derives from the world class museums, palaces and gardens. Dinner at a Halal restaurant. Transfer back to hotel. Overnight in Madrid. Buffet Breakfast at the hotel. Depart for the monumental imperial city of Toledo, with much history and beauty and unusually so well-preserved that the entire old city is a national monument and a UNESCO World Heritage Site. Toledo is called “City of Three Cultures” since, for about 8 centuries, Jews, Christians and Muslims lived together in peace here. Visit the mosque of Cristo de la Luz which was known as Mezquita Bab-al-Mardum, deriving its name from the city gate Bab al-Mardum which is near an area where wealthy Muslims used to live. Discover the famous old techniques of Damasquinado (encrusting of precious metals in steel) at a local workshop. Enjoy a panoramic sightseeing tour of the city of Toledo. Have lunch at a Halal restaurant. Then return to the hotel for some rest. The rest of the day is free. Buffet Breakfast at the hotel. Enjoy a sightseeing tour of Madrid. Lunch will be in a halal restaurant. Upon arrival in Seville, transfer to hotel and the rest of the time is yours to leisurely discover the charming streets and squares of this amazing city. The cathedral stands on the Great Mosque of the 12th century. Today, the only part which remains of this structure is the minaret, known as the Giralda. It is said that the Muezzin used to ride up on a horse to call the Azzan. Buffet Breakfast at the hotel. Enjoy a morning discovering monumental Seville. You will visit the Royal Palace of Seville, called “Alcaza of Seville”, built for a Christian king in Islamic Architecture. The visit ends with a pleasant walk through the charming. Complete this fantastic tour with a panoramic sightseeing through the Iberoamerican Exhibition of 1929 and the famous Plaza de Espana. Transfer to a halal restaurant for lunch then proceed to your hotel and check-in. The rest of the day is free to stroll around at leisure. Buffet Breakfast at the hotel. Depart for Cordoba (142 km). Upon arrival, visit this historical city, the ancient capital of the famous Umayyad Caliphate. Cordoba has one of the largest old city centers in Europe. Visit the Great Mosque of Cordoba, one of the most beautiful examples of Muslim art in Spain, built in 785 by Emir Abdurrahman I. The mosque underwent several extensions over later centuries. Abdurrahman III had a new minaret built whilst in 961 Al-Hakam II extended the ground plan and decorated the “mihrab”. Have lunch at a halal restaurant. Continue to Garanada (201 km). Check-in upon arrival at your hotel. Buffet Breakfast at the hotel. Enjoy a visit to the Magnificent Alhambra, a beautiful complex of buildings and gardens, which was the largest political and aristocratic center of the Moslem West. The Palace premises comprise courtyards and fountains, as well as the Nasric buildings that served as living quarters for the monarchs. The courtyard of the Lions with its fountains is one of the most beautiful in the complex. Lunch in a Halal restaurant. Transfer to hotel to freshen up. Proceed to the Granada Great Mosque with its gardens to meet the local Muslim community and enjoy the Sunset from the famous St. Nicolas Viewpoint. Back to hotel. Buffet Breakfast at the hotel. Drive to Valencia (498 km). Lunch is at a Halal restaurant. Visit this Mediterranean city including the extraordinary City of Arts and Sciences, an impressive example of Avant Garde architecture surrounded by attractive streams and pools of water. Transfer to hotel and the rest of the day is free. Buffet Breakfast at the hotel. Depart by coach from Valencia to Barcelona (349 km). Upon arrival, transfer to a Halal restaurant for lunch. Transfer to hotel and check-in. Rest of the time at leisure to explore this exciting city and for shopping. Buffet Breakfast at the hotel. First visit this morning – Barcelona – one of the most vibrant cities of Spain. Explore the Plaza de Catalonia, the Gothic Quarter, Plaza Sant Jaume and Town Hall on foot. One of the best places to catch the rhythm of the city is in La Rambia. Then, by coach, continue on to the Villa Olimpica and the Port Olympic. Ascend Montjuic Mountain, which offers a panoramic view of the city and harbor. Proceed to a Halal restaurant for lunch. Then transfer back to the hotel and the rest of the day is time for leisurely shopping. Buffet Breakfast at the hotel. Check-out of the hotel to be transferred to Barcelona airport for return flight back to Manila. Visit Hello Kitty and Friends in China's first ever themed park! This theme park will display 11 Hello Kitty facilities, including a luxury resort decked out with plush pink furniture, chandeliers, and bows. The amusement park will also hosts Hello Kitty-themed performances, parades and features a decorated Ferris Wheel, along with movies, shops and catering services. Wrapped up together with a trip to Mt. Putuo, known as the "pure land" in China. The golden sand beaches, fascinating rocks, marine-made caves, rhythms of the waves sound and the surreal scenes come together, earning the island a reputation of endless beauty. For only $ 1,320 person, you will be able to experience one-of-a kind KITTY adventure, combined with natural scenery of the sacred Mt Putuo. 03 Nights' accommodation with breakfast on Twin Sharing. Dhow Cruise with Dinner & Transfer. All Applicable Taxes (Tourism Dirham is not Included). All transfers are based on sharing basis. Okay to Board charges(if Applicable). Also please be informed that the above cost does not include any surcharges which might be levied by the respective Hotels during any Special Events & Exhibition taking place during the requested date.e. Visit Chiangmai and Bangkok and grab a chance to see the amazing Doi Suthep and Phuping Palace, and experience a luxurious dinner cruise at Chaophraya Princess and an exciting tour in Safari World. Hanoi showcases sweeping boulevards, tree-fringed lakes and ancient pagodas, Truly, it is Asia’s most atmospheric capital. It is an energetic city on the move, as motorbikes and pedestrians ebb and flow through the centuries-old commercial chaos. Price starts at $ 214 per person (minimum of 3 persons). Book now!!! 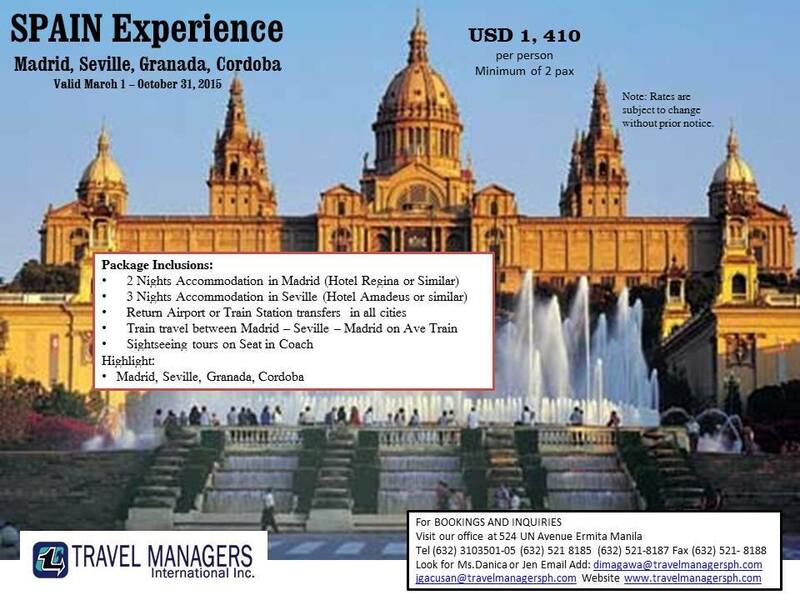 Experience Spain... and get a chance to visit the cities of Madrid, Seville, Granada and Cordoba. 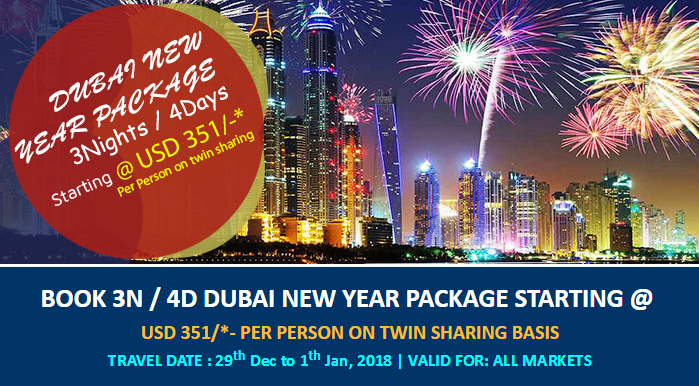 Discover this country known for its fantastic nightlife, good weather, beaches, major sporting events, cities that are the height of fashion, nature activities, and much more you ever imagined..
Book now for as low as $ 1,410 (minimum of 2 persons). Discover Paris...a country with timeless and instantly recognizable architectural icons, along with exquisite cuisine, chic boutiques and priceless artistic treasures. 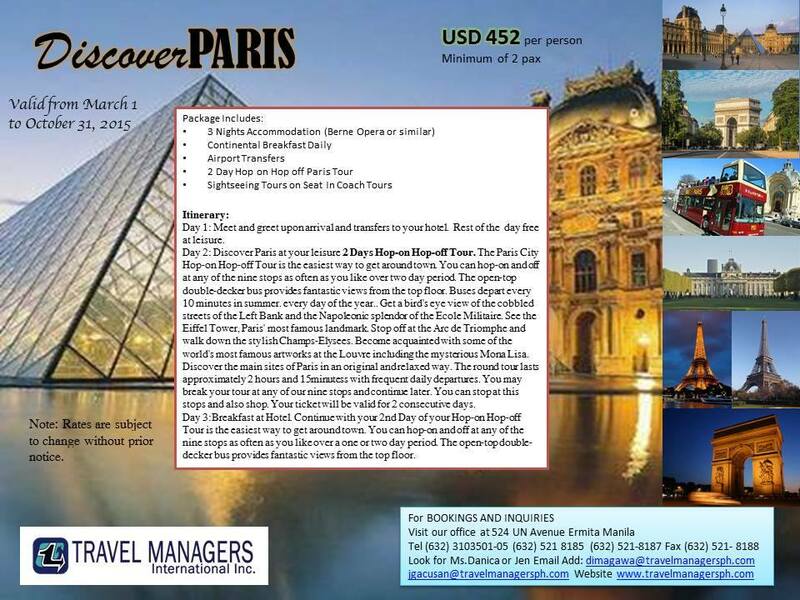 Enjoy this package for as low as $ 452 per person (minimum of 2 persons), and visit amazing places in Paris. Valid from March 1 - Oct 31, 2015 only. Rome...the Eternal City.. With its amazing palaces, millennium-old churches, grand romantic ruins, monuments, statues and graceful fountains, Rome has an immensely rich historical heritage and cosmopolitan atmosphere. And making it recognized as one of Europe's and the world's most visited, influential and beautiful capitals. Today, Rome has an emerging nightlife and is also seen as a shopping heaven, being regarded as one of the fashion capitals of the world. Experience Rome at its grandest. Price starts at $ 577 per person (minimum of 2). Eastern Europe is a region that encompasses many different cultures, languages, and histories. A trip through this region can be like indulging into a history book.. Eastern Europe's rich past is visibly present in its amazingly preserved palaces, enchanting castles, magnificent churches and superb plazas. Head to Eastern Europe and enjoy guaranteed adventure with its surreal, exciting and surprising sights to see. 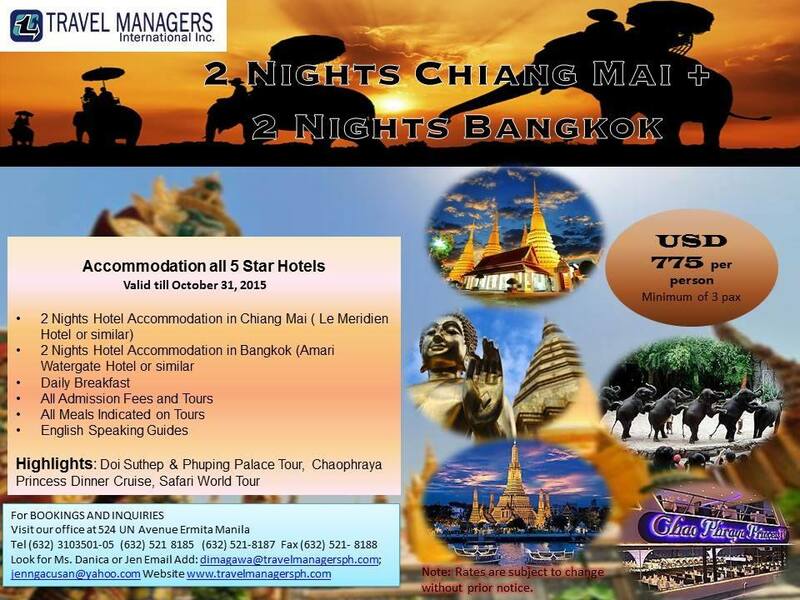 Price starts from $ 839 per person (minimum of 2). Bali is magical... It is the most famous island in Indonesia. It blends spectacular mountain scenery and beautiful beaches with warm and friendly people, a vibrant culture and out of this world resorts. 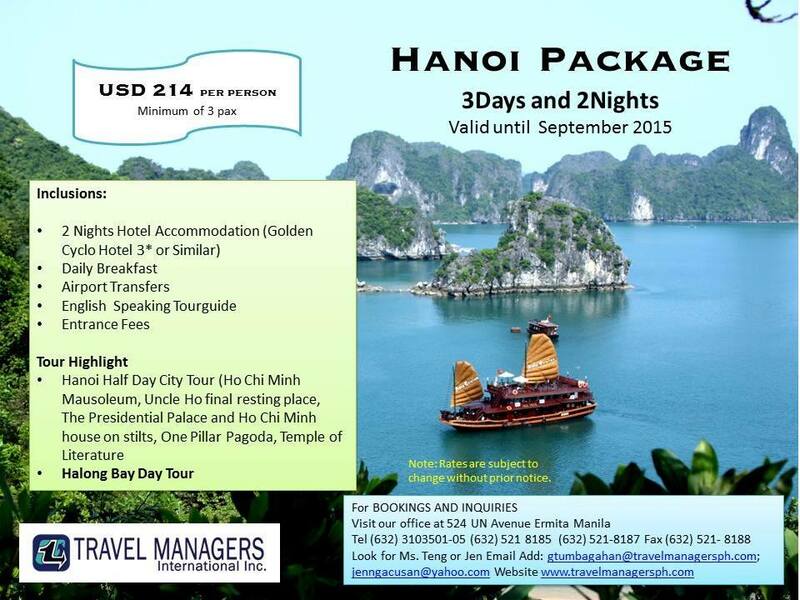 Avail this 4D3N Package, for as low as $ 173 per person (minimum of 2 persons). Rate valid until September 2015. 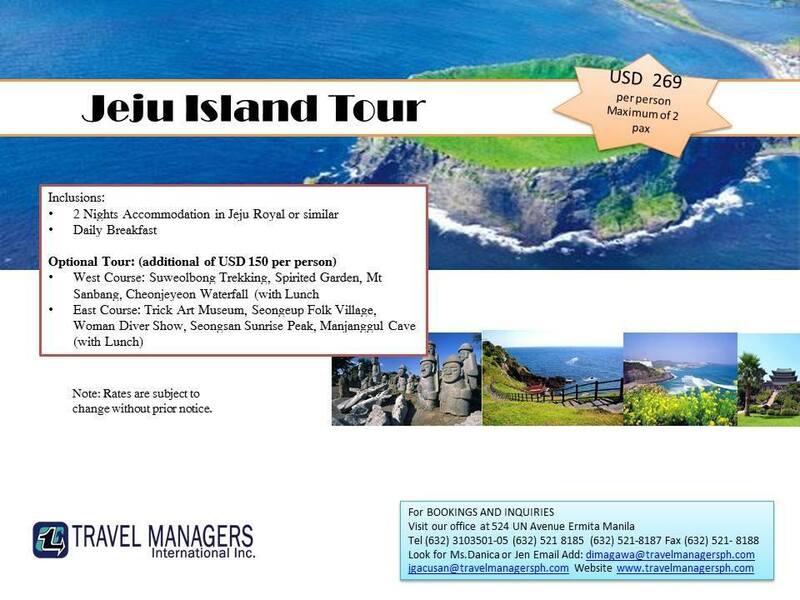 Discover JEJU ISLAND...The tropical charms of Korea’s largest island, have been one of the tourists' favorite holiday destination. Discover more about its beautiful beaches, volcanic geography, lush countryside, and ancient culture that includes traditions, dress, architecture, a dialect separate from the mainland and 18,000 gods. 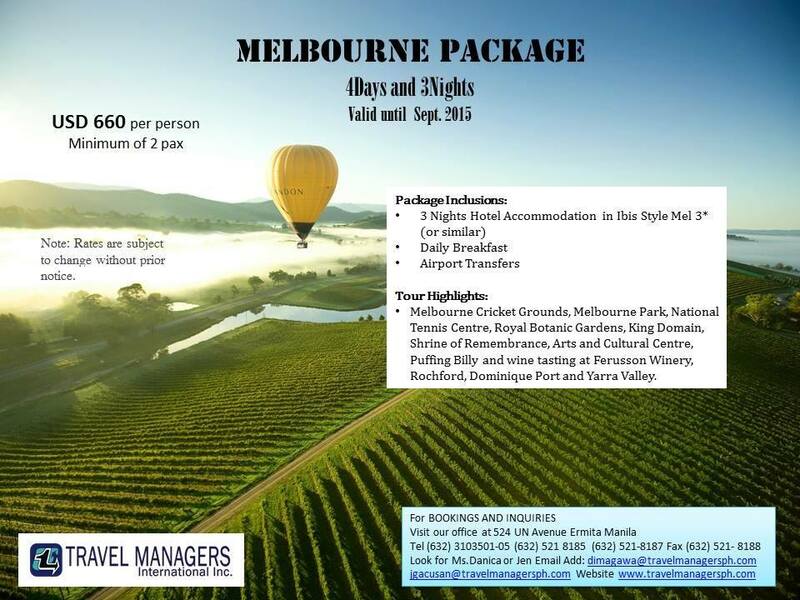 Price starts from $ 269 per person. Discover Gold Coast, Australia...this city serves up a steamy cocktail of sun, surf, sand and activity. This is one of the best places to learn to surf in Australia..Its shimmering strip of high-rise apartments, restaurants, bars, clubs and theme parks, also defines Gold Coast a place, famous for fun. 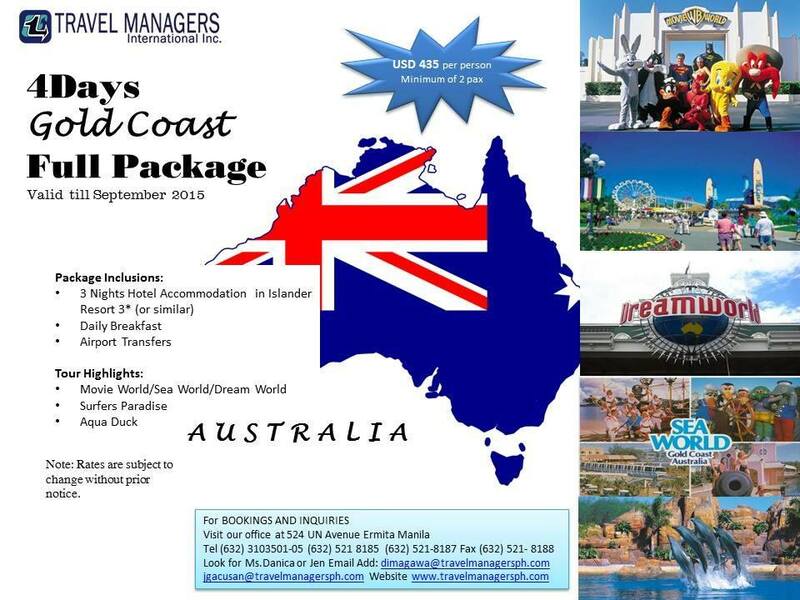 Enjoy this 4D3N Package, complete with accommodation, transfers and tours at Dreamworld, Sea World and Movie World, along with a visit to Surfer's Paradise and Aqua Duck. 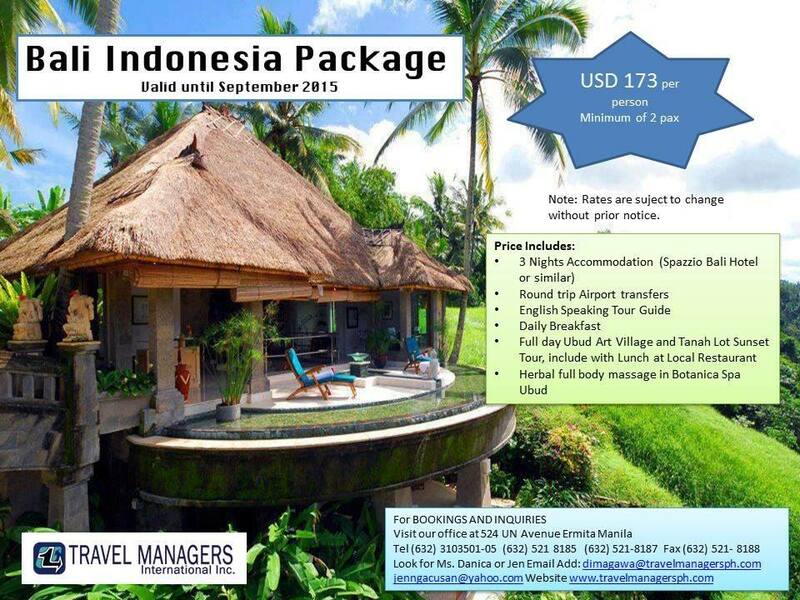 Rates valid until September 2015 only. Stylish.. arty and sporty...That is Melbourne, Australia! It is a city that is both dynamic and cosmopolitan. Its stately gold rush-era architecture and a multicultural make-up, reflect the city’s recent history, while edgy street art, top museums and sticky-carpeted band venues point to its present-day personality. Brisbane is an energetic town on the way up, with an edgy arts scene, booming nightlife, and a great coffee and restaurants. 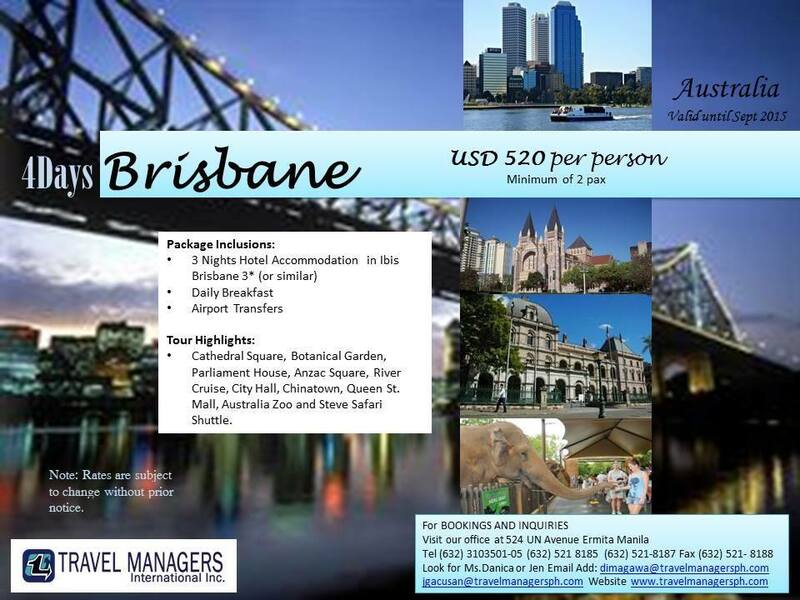 Its lush parks and historic buildings complete the picture, making Brisbane an outdoorsy city of the country. Book now, for only $ 520 per person (minimum of 2 persons)!!! 4 amazing places in ONE PACKAGE !!! 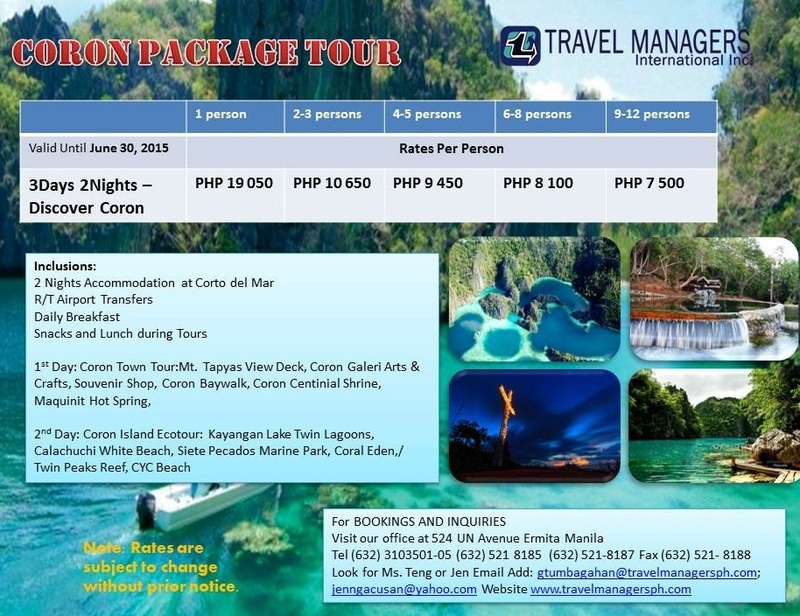 This package includes a chance to experience longest dual zip line adventure in Bukidnon, indulge in the beautiful White Island, Hotspring and Katibawasan Falls in Camiguin, get enchanted on the splendid Maria Cristina Falls in Iligan and battle the ferocious white water rafting of CDO. 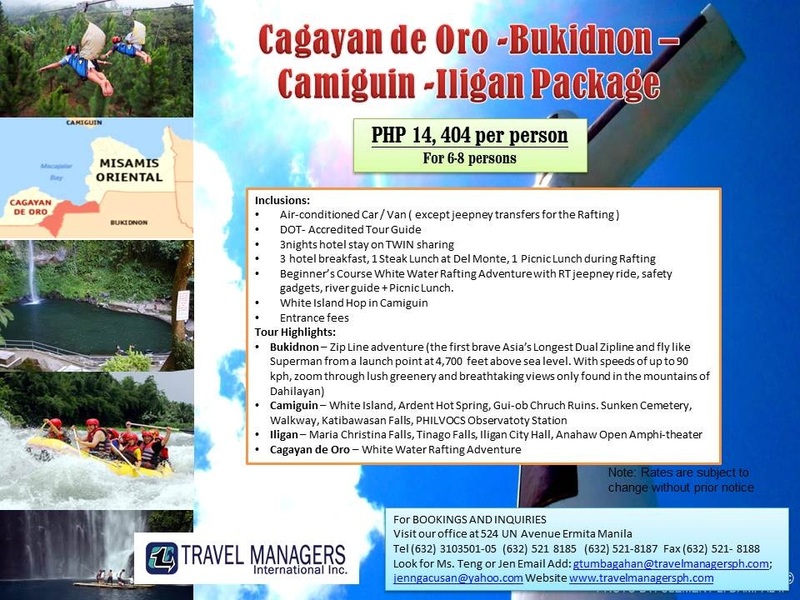 Avail our 4D3N package in Cagayan De Oro City-Bukidnon-Camiguin-Iligan, for a minimum of 6-8 persons and experience this one-of-a-kind full-packed adventure with your friends. 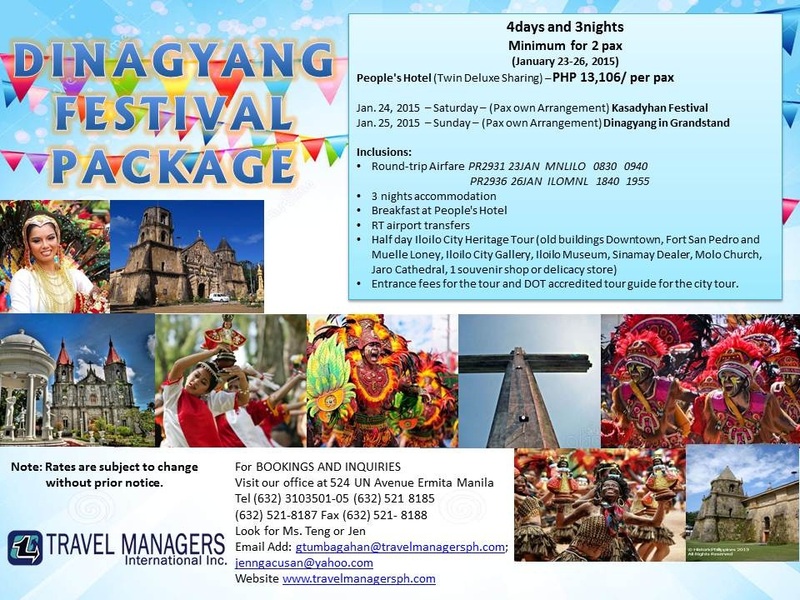 Rate starts for as low as PHP 14,404 per person. Davao is known for a variety of picturesque landscapes, fruit plantation and orchid farms. This also serves as the main gateway to Southern Philippines. 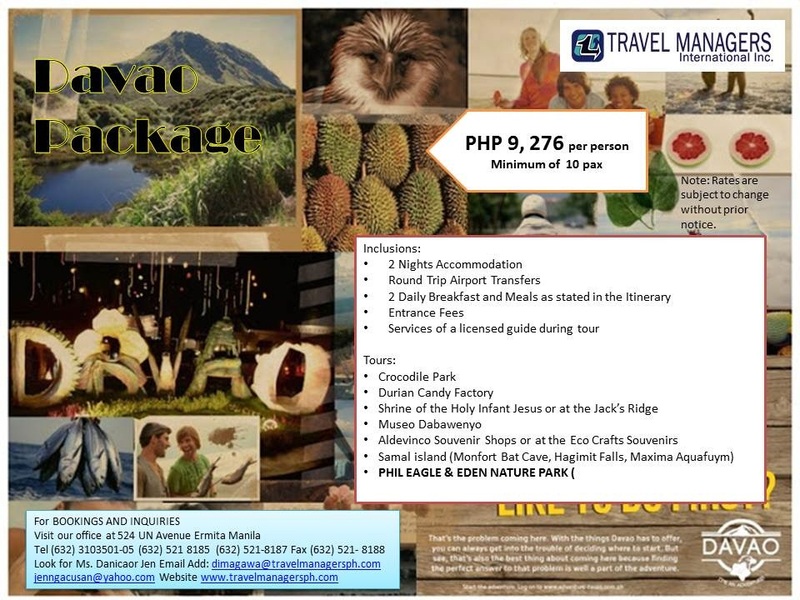 Explore the magic of Davao with this 3D2N Package, inclusive of accommodation and guided tour to the beautiful Samal Island, Crocodile Park, Philippine Eagle and Nature Park, Durian Candy Factory, Museo Dabawenyo, Shrine of the Holy Infant Jesus and Aldevinco Souvenir shops. 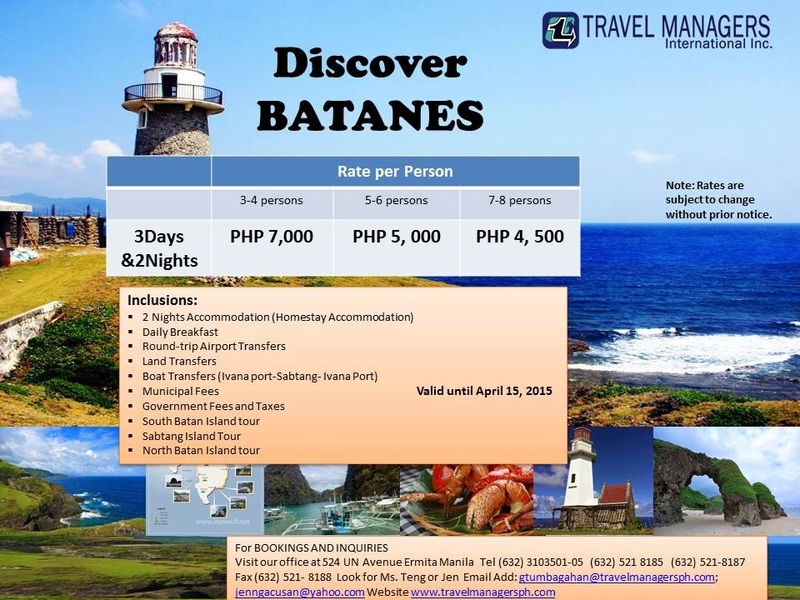 Discover Batanes....an overwhelming combination of majestic, imposing landscapes and quaint lifestyles. Uncover the beauty of its extremely pretty scenery, amazing culture, great food and hospitable people--the IVATANS! Inclusive of Room Accommodation, breakfast, transfers, Sabtang Tour as well as the North and South Batan Tours. Discover CORON, a wedge-shaped limestone island, being covered by mangrove forests. It has seven lakes, famous of which is the nationally-acclaimed cleanest lake in the Philippines, the Kayangan Lake. It also has a number of islands with white beaches and clear blue waters perfect for snorkeling, deepsea fishing and shipwreck diving. 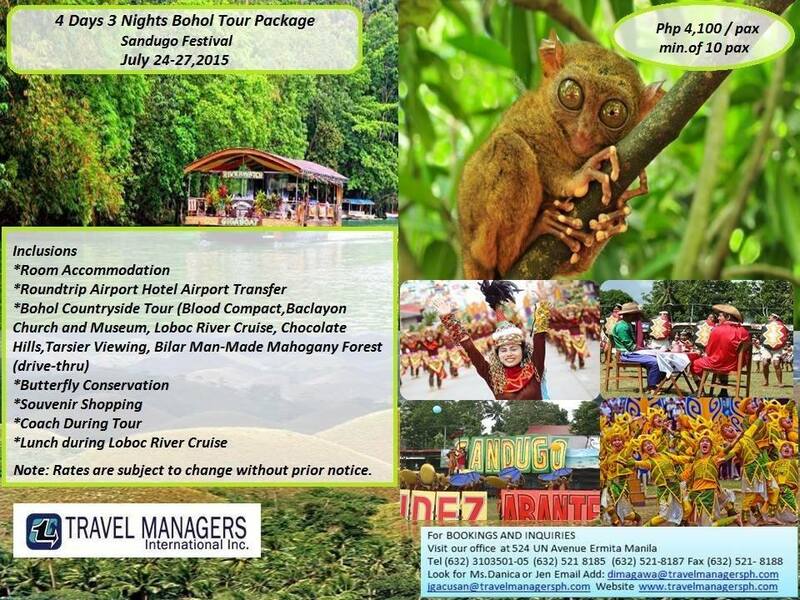 For a minimum of 9 persons, price starts from PHP 7,500 per person. Promo valid until June 30, 2015 only. Rates are subject to availability on the time of booking. 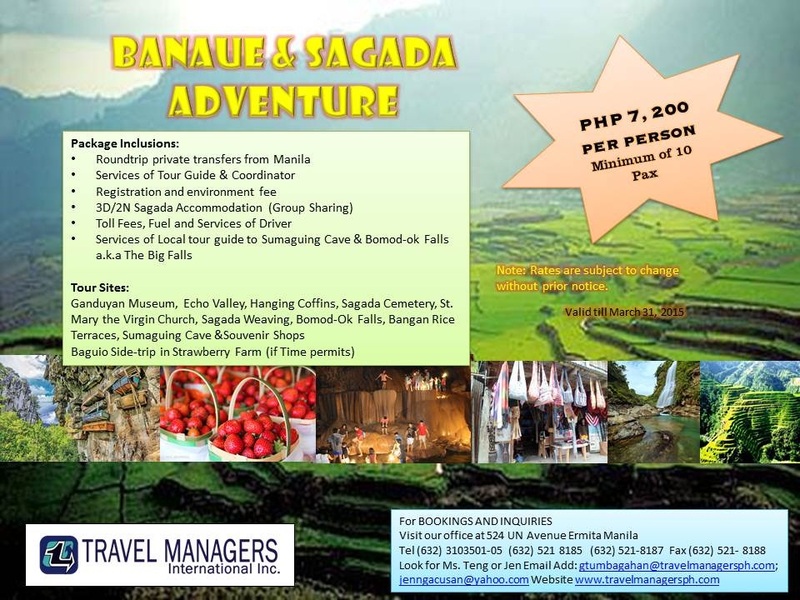 Explore the beauty of Banaue and Sagada...which is known for its cold weather and exciting sights to see. In this tour package, for only a group of 10 persons, you will be able to visit Ganduyan Museum, Echo Valley, Hanging Coffins, Sagada Cemetery, St Mary the Virgin Church, Sagada Weaving, Bomod-ok Falls, Bangan Rice Terraces, Sumaguing Caves and Souvenir Shops. For only PHP 7,200 per person. Book now!!! Promo rate valid until March 31, 2015 only. Peak season surcharges might apply. 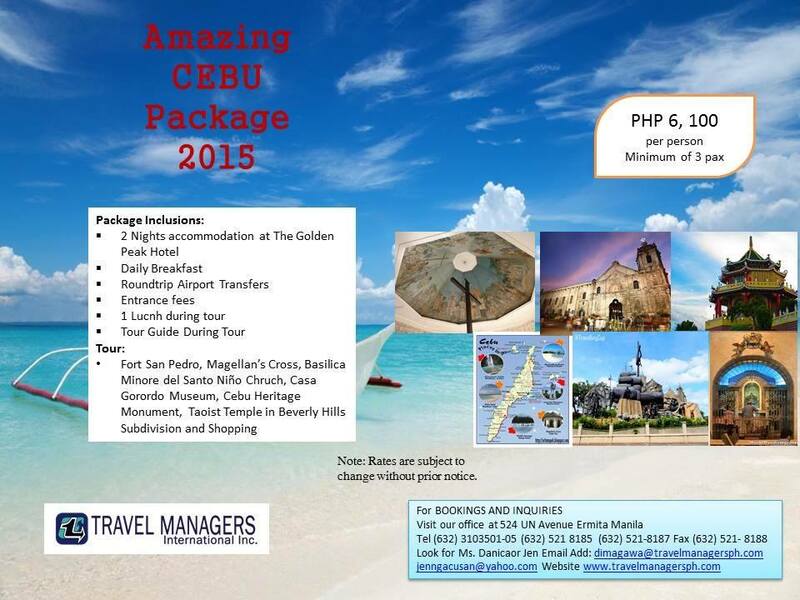 Be amazed with Cebu.. Cebu is the hub around which the Visayas revolve. It is the most populated island in the Philippines. The main attractions are its white-sand beaches and spectacular diving spots, their lively bars, emerging eateries and great island-hopping opportunities. Manila, the capital city of the Philippines, is a densely populated city on the island of Luzon. The city's convenient location in the south pacific has made it one of the busiest and most diverse places in the world. From Spanish colonial architecture to modern architectural marvels and an exciting nightlife, Manila has everything you're looking for. Just a 2 hour drive from Manila, let's visit Tagaytay where you can relax, unwind with the cool and breezy climate.